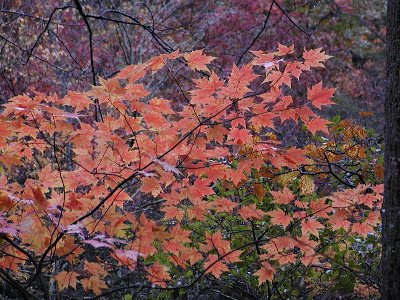 At the beginning of this sixth week of Autumn in the mountains of Western North Carolina, we were enjoying the bright, sunny yellows of hickories, birch and some of the maples at our elevation (2,300 feet). As the week has progressed, we’ve had quite the interesting weather pattern, including tornado watches! 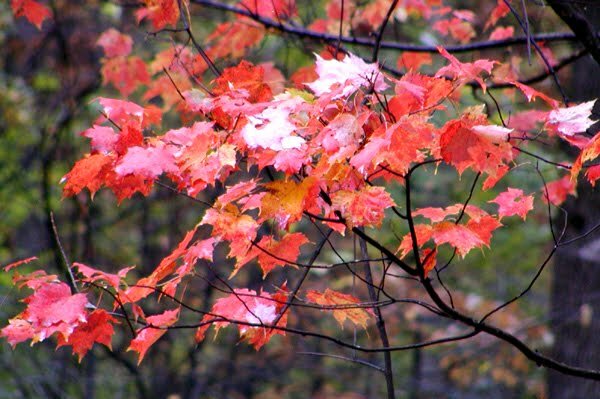 (Thankfully, the weekend forecast is calling for a lovely sunny weekend in the mid-60s.) The rain we did get was heavy enough to cause a lot of the yellow leaves to fall–early compared to the previous three years. Never fear, yellow leaf lovers, Mother Nature has left us with some standouts to enjoy this week, such as this golden beauty at the southern end of our property, which is still changing as of October 27. Biltmore Estate — The views and the grounds at Biltmore Estate are still beautiful as the colors change around Asheville. Along with the rooftop tour we suggested last week, another activity you can do to get out there and enjoy the fall foliage in the North Carolina mountains is touring around the Estate’s bike trails. You can rent bikes at the Estate or bring your own. 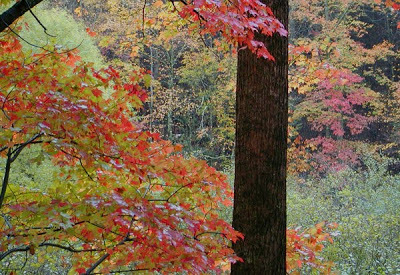 McDowell County — our county is an outdoor lover’s paradise. 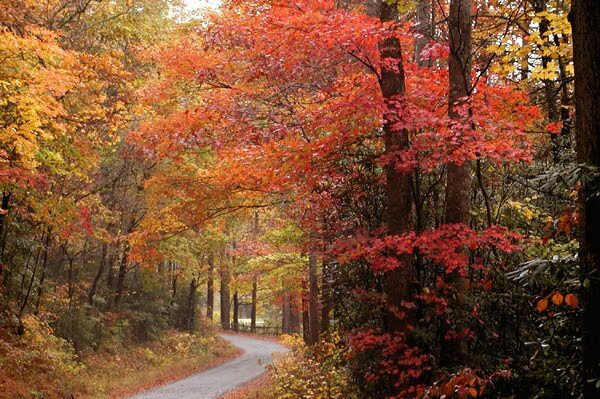 Hiking trails (highly recommended: Catawba Falls), fishing opportunities and scenic drives are abundant. 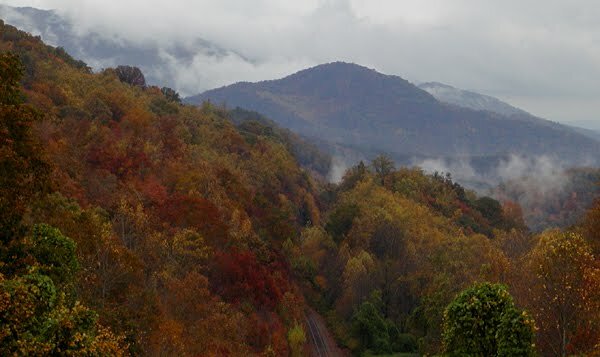 If you’re interested in taking a scenic drive and learning about a neat connection being made between the history of handcrafts in the area and the present day, we suggest making some stops on the McDowell Quilt Trail. The Quilt Trail, a driving trail to see painted quilt blocks erected on homes, businesses (including ours!) and unique places, was established in September of 2009. There are more than 55 quilt blocks out there for you to discover. 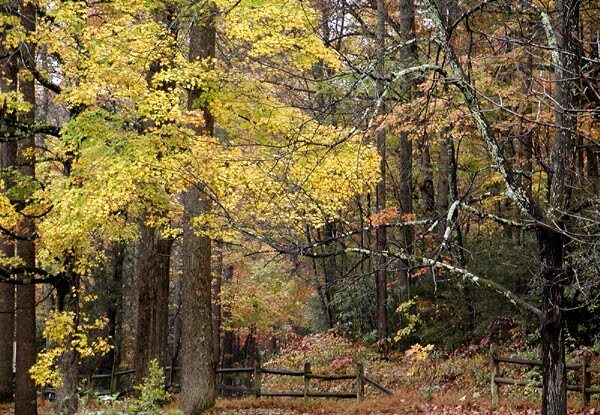 Point Lookout Trail — this trail is a paved 3.5-mile greenway bike/walking trail that was once the old highway running through the area (Old Highway 70). The trail is named for Point Lookout, an overlook on the trail with views of Royal Gorge (part of Royal Gorge pictured above). The Point Lookout Trail is an east-west scenic leg of a “triangle loop”, connecting the southwest end of our road (the unpaved portion of Mill Creek Road) and the southeast end of the paved portion of Mill Creek Road. Adventurous/athletic guests like to do the “triangle loop”, which is 8.5 miles of varying elevation changes. However, the Point Lookout Trail is lovely all by itself. The woodsy eastern end, especially, can take on a surreal movie-set-like quality, especially this time of year with leaves drifting down all around you. 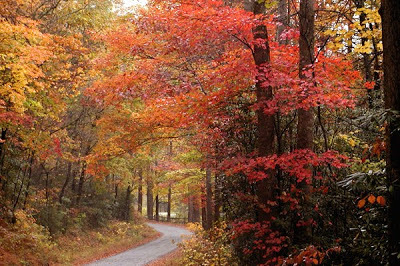 Chimney Rock Park — Our friends at Chimney Rock Park (a state park located about 30 minutes from the Inn on Mill Creek), tell us that the fall colors at the Park are close to peak. Chimney Rock Park is part of the Hickory Nut Gorge/Lake Lure area, and usually has nice fall foliage well into the first part of November, so we’re pretty sure we’ll be recommending them next week as well. 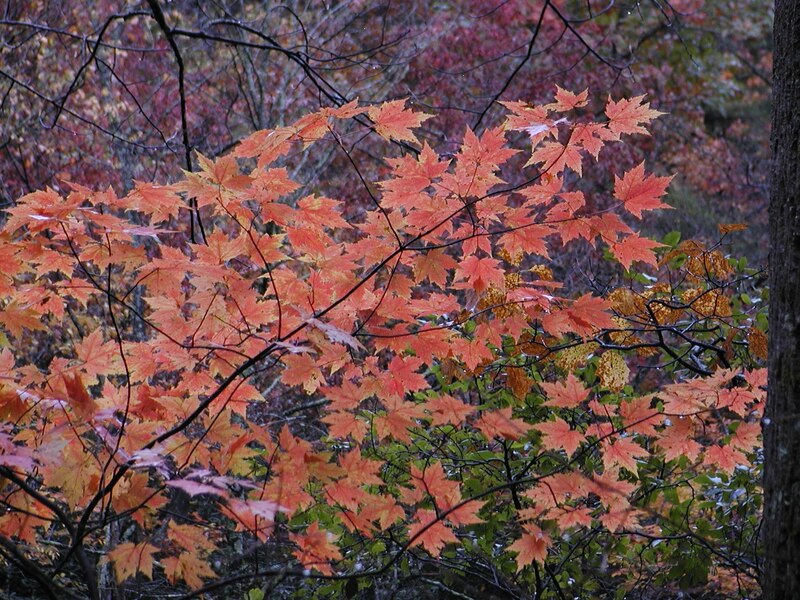 Next week will likely be our last week of reporting fall color in the area for this year. See you then!